All of our 338 luxurious guestrooms offer city views of the Gateway Arch and Forest Park or the Mediterranean-style courtyard featuring a world class heated outdoor pool. Every room is smartly appointed and equipped with coffee makers / flat-screen TVs / premium toiletries and in-room safes. ADA compliant rooms available. Concierge services available for area attractions. Hotel features a complimentary fitness center. Additional features include a flower shop / barber shop / gift shop and 5-screen historic movie theater with stadium seating and a theater bar. 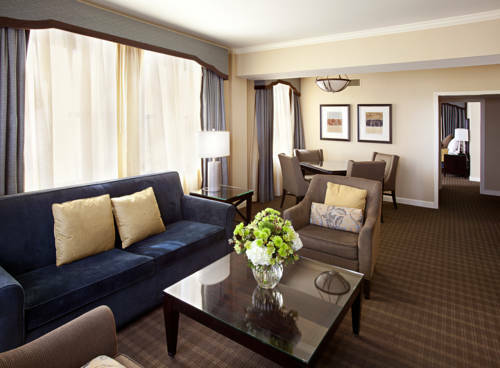 Dining options include Chase Club / The Preston / Sidecar /The Tenderloin Room and in-room dining. Complimentary parking is available in a lot adjacent to the hotel - there is an option to valet park. Situated in the vibrant Central West End neighborhood - The Chase Park Plaza is nestled against the natural oasis of Forest Park. The downtown St. Louis hotel is surrounded by the citys most iconic attractions and cultural sites including the famed Gateway Arch- Busch Stadium- Missouri Botanical Gardens- St. Louis Zoo and more. Lambert International Airport is just 11 miles from the hotel. A blend of sensual ambiance and rich flavors- The Tenderloin Room is a landmark St. Louis restaurant with a mastered-to-perfection menu. The Preston serves an eclectic menu using the freshest/ local ingredients to craft bold flavors. The Preston serves inventive food for breakfast/ dinner and Sunday brunch. Chase Club offers a delectable menu of gastropub fare with a dash of gourmet and perfectly prepared cocktails. Restaurant transforms into a legendary music venue featuring live performances by local musicians. Khorassan Ballroom featuring the largest event space in the Chase Park Plaza. ~25 miles from Saint Louis. ~52 miles from Saint Louis.